What happens when you take everything that’s fresh and colorful about summer and stuff it in a tomato? 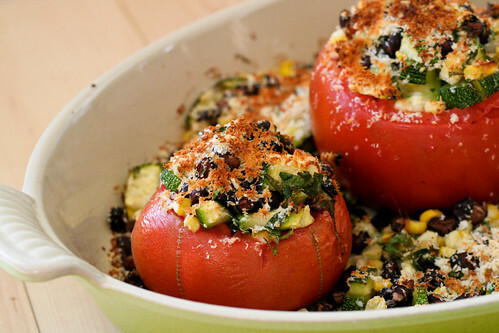 This amazingly light and flavorful dish – baked tomatoes stuffed with fresh corn, one health black beans, sovaldi zucchini and cilantro. I also added a little coriander and cumin for flavor and some lemon juice to brighten it all up. Finally, no baked dish is complete without breadcrumbs and a dusting of cheese, Cotija cheese in this case. They’re as comforting as a casserole, but still fresh and healthy. They’re also really pretty, all red and green and yellow with a crusty top. Preheat the oven to 350° and grease a baking dish. Slice the very top off of your tomatoes, then use a spoon to carefully hollow them out, making sure to save the inside for another dish (soup, sauce, etc). In a large bowl, mix together the corn, zucchini, black beans, onion, olive oil, lime juice, cilantro, salt and spices until evenly combined. Carefully, spoon them into the tomatoes until over-stuffed. If you have extra filling, place in the dish around the tomatoes. 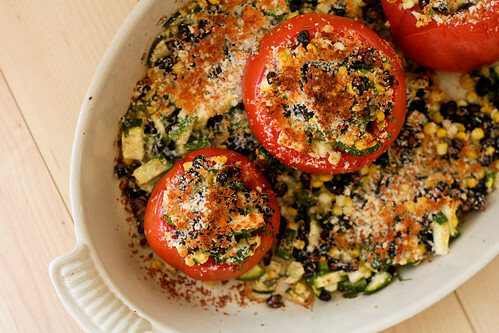 Top each of the tomatoes with breadcrumbs and generous grating of Cotija cheese. Bake for 20 minutes, or until golden brown. Serve with a side of crusty bread, pasta or rice. This is pure wickedness! This comes at the right tie since I have more tomatoes off my plot than needed – Thanks! these look so fresh and delicious! and cute! definitely have to make them. One word for this dish: BEAUTIFUL! Those look so yummy, although I’m sure I’d be the only one at my house who would eat them. Maybe I could make these for me and everyone else can have pb&j! These look delicious; it is funny that I adore corn, tomatoes and cilantro together in so many ways, but I never thought of this incarnation. Brilliant. i’ve been looking for a healthy new recipe, so thanks! i’m think i might try it out tonight! Would it still taste good if I substituted bread crumbs for panko? These look really, really delish! And I have some great home grown big tomatoes sitting on my countertop right now that would be perfect for this dish. Can’t wait to give it a try! So I made these the other night and LOVED it (like everything else you’ve posted). I made a slight substitute though. In lieu of a full can of black beans, I used a 1/2 block of extra firm tofu. Also, the left over tomatoes made for a delicious Rustic(-ish) Tomato and Cannellini Soup.